We saw many hedgehog cactus, one with big fuchsia colored blossoms. 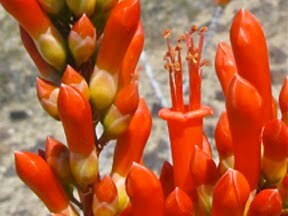 There were stands of ocotillo in bloom. Some of the unopened flowers looked like rows of overextended lipsticks on display. We saw golf ball size fishhook cactus with red fruit, many California barrel and a few Mojave pineapple cactus. 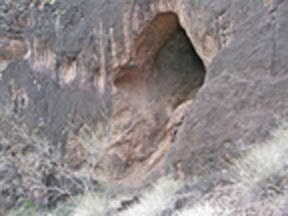 The floor of the Palm Tree Cave is very steep in the front half of the cave. In back there are two moderately steep terraces. In the front and center of each of these there are four foot diameter rock formations that appear to have been made by dripping mineral-laden water, similar to stalagmites in limestone caves. Even though showers and cold had been predicted for the day, I said to Buck, "The storm will bypass us." Cold winds and thick clouds then rolled in. A few light snowflakes turned to graupel, a cold night, morning hoarfrost and ice in the water bottle. I decided to quit predicting weather in the Mojave. “There it is; there it is!” Pov shouted exuberantly while grabbing my arm and jumping up and down. She had found the only saguaro in Whipple Wash that we were going to find. We were on our way out after two days looking for this cactus without success. This has been said to be the most difficult section on the Desert Trail. It is mostly cross country going over the crest through reed bogs, steep slopes, catclaw, cactus, yucca and granite slabs. We found multiple waterfalls and pools in slot canyons, and a spring piped to a cattle watering tank now overgrown with reeds and willow. On traversing the crest there appeared to be several segments where major rock cliffs would need to be circumvented. Each one of these looked too difficult from a distance only to provide a reasonable path when approached. We reached the tilted Big Bertha plateau but found no big cactus there. While in the Ward Valley wash we saw a female greater earless lizard that was regenerating its tail. In the photograph it can be seen to have a pineal eye spot which occurs in these lizards.